The afternoon started out just splendid. The boys and I wanted to take advantage of the cooling October temperatures and we knew the swing set was the place to do it. After three pairs of shoes were carefully strapped on, we ventured out. We swung together, we leaped over Susie-made holes together, and we collected together. Nathan and Owen set to work under the big oak tree, collecting all the acorns (pronounced: a-kerns) they could carry. When Nathan's hands started getting full, I was happy to jump up and help him. During this time, I may have let the bigger-than-he-thinks baby out of my sight for a few seconds. 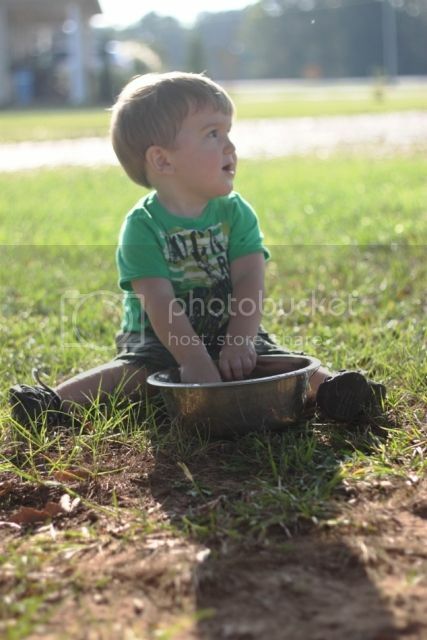 I continue to watch as Owen marches over to the driveway, scoops up fistfuls of rock and gravel, does a pronounced about-face and marches right back to plop them into Susie's water bowl (more dirt than water at this point). Cute, right? 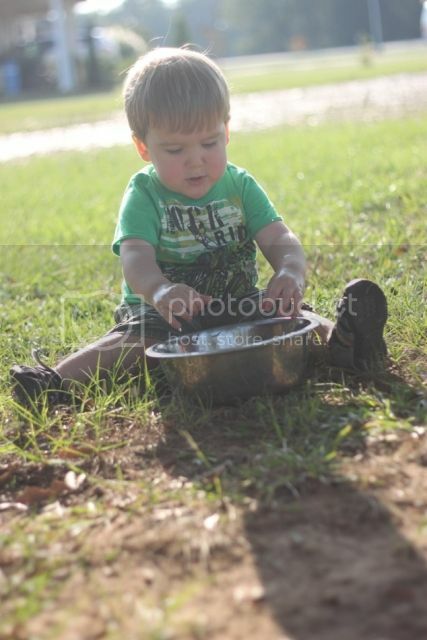 Little Owen enjoying the combination of two of his favorite things - dirt and water! It was at that time that I heard a different splash. That must have been a pretty big rock, I thought to myself. I decided it was best to let things go as they may. It was a lovely afternoon and Nathan and I set up two lawn chairs and just watched this baby go to town. He cracked us up! However, six o'clock came quickly and Nathan's stomach was growling. I didn't even say a word, but started to approach Owen in a manner that he quickly figured out. 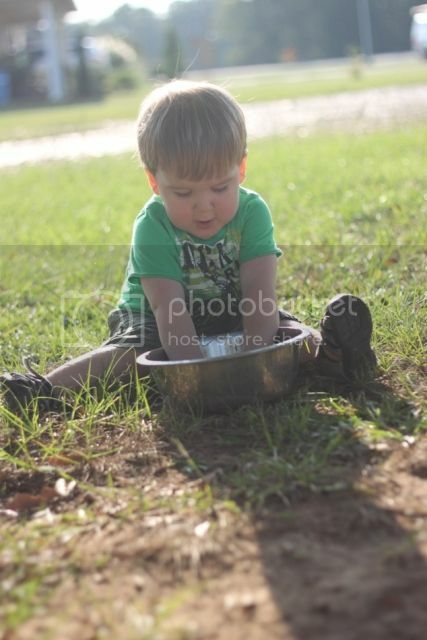 The dirty baby crawled to his feet, dumped his water, and took off across the yard, bowl in hand. When I finally caught up to him and convinced him to come back, this is the face he made. The. Whole. Time. As for what happened next, let's just say I've never bathed a standing, screaming baby before and I'd really rather not attempt it again. Luckily a little Toy Story and a few chicken nuggets did the trick to calm him down. Next time, I think we'll start our outdoor adventures a little earlier. :) Hope everyone is having a happy Thursday! I love my grand boys.., and their mommy and daddy too! Too precious! !